Steve Spurrier and the Orlando Apollos are 6-1 and have already clinched a playoff spot in the East so perhaps they lay off the gas some. The Memphis Express came from behind last week led by former Troy QB Brandon Silvers to upset the Birmingham Iron and by doing that the Express are still alive in the playoff race. It’ll be interesting to see how many snaps the Express give recently signed Johnny Manziel. Apollos may also look to sit AAF star QB Garrett Gilbert at some point in the game since they’ve already clinched the playoffs. Has there been a more inconsistent and up and down team than the San Diego Fleet. I get it, they had their starting QB knocked out for the season but still the Fleet offensive can look amazing one game and awful the next. Mike Martz has got to find a way to limit the turnovers and avoid giving up the big play on the defensive side of the ball. The Salt Lake City Stallions are much much better than their record. They’ve been in all of their games and just haven’t found a way to close out games and grab the win. The Stallions are the more desperate team here and need this win if they want any chance of the postseason. If you look at the amount of blowouts they’ve given up, the Atlanta Legends have been the AAF’s worst team. Aaron Murray came in and gave the Legends a bit of a spark but the team has came back down to earth from their two game winning streak. Can Aaron Murray and the Legends dig in and find their spark again? 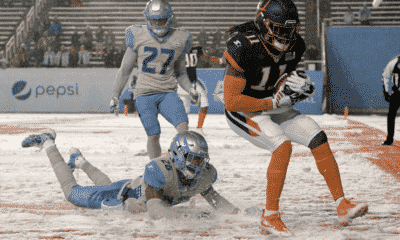 The Birmingham Iron really should have won last week against the Memphis Express, but they choked down the stretch. If the Iron want any chance at a postseason, they need to avoid the 2nd half collapse and handle their business. This is a must win game here. This is the best game of the weekend if you ask me. The Arizona Hot Shots have suddenly found their stride after struggling for a few games. John Wofford has regained his early season form and the Hot Shots are playing their best ball of the season. The San Antonio Commanders are very similar to the Hot Shots because they seem to be playing their best ball of the season at the moment and hit a mid season slump prior to finding themselves. Logan Woodside and Marquise Williams are both capable QBs. Woodside got injured last week but that didn’t stop Williams from leading the Commanders to a nice win over the Stallions. The Commanders also have the best home field advantage by a mile.